Every year, I am sure you will be look forward for the Mid-Autumn Festival, its an important festival to the Chinese, coming only after the New Year or Spring Festival. This is good as you may be thinking what to give for loved ones and relatives or friends. This can be a nice gift for them, check out the new flavours as mentioned below. This Mooncake Festival, Resorts World Genting marries tradition with innovation, as it presents a stunning selection of premium mooncakes. Beginning August 1 2016 and running until September 15 2016, Genting Highlands Malaysia’s favourite highland getaway will be able to take home boxes of delight in the shape of some tried-and-true flavours, and some unique creations. On Mid-Autumn night the harvest moon is supposed to be at its brightest and fullest, which gives rise to the celebration’s other name: Mooncake Festival. The Mid-Autumn Festival originated as a harvest festival three thousand years ago, as a way for agrarian Chinese to celebrate the bounty of their fields and orchards. It was a time for the cessation of work, and one of the rare nights in which hard-working farmers stayed up late to admire the lustre of the full moon while enjoying the delicacies associated with the festival. Apart from pumpkin, pomelos, duck and wine, the central food focus of the festival was a dense, wheat flour pastry called the mooncake. So named for its circular shape, mooncakes were traditionally made with red bean paste, lotus paste and nuts. I took some photos at First World Plaza, nice decoration there, click on the link to view it. 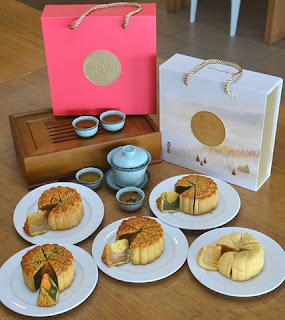 The selection ranges from the humble red bean paste mooncake, low-sugar white lotus paste, traditional lotus paste with single yolk, lotus paste with double yolk, Ng Yan [assorted nut mooncake] and Kam Tui (nuts and preserved fruit mooncake) to more subtly creative options such as green tea lotus paste and durian lotus paste, white lotus paste with black sesame yolk, Golden Jade with single yolk, Pu Er lotus paste with single yolk and blueberry paste mooncake with single yolk. Delicious new options for the modern mooncake fan include the light snow skin mango with pomelo, this is my favourite I love mango and it's perfect match to try this. If you like to eat white lotus paste, you'll also like the white lotus paste with dried mandarin orange jingsa, sweet corn paste with caramel nuts, cheese jingsa, Golden Jade with lime and nuts, and Golden Jade with buttermilk custard. These new alternatives are lighter in texture and flavour, while still espousing the traditional feel of the more established mooncake variants. On sale during the Mid-Autumn period are specially designed God of Wealth cookies for two pieces. These shaped biscuits are made using the recipe for traditional mooncake pastry, and are thus, you know it that it is perfect with freshly brewed black tea. Mooncake counters at the entrance of Cloud 9, Genting Palace, Good Friends Restaurant, Resort Hotel Lobby, Hainan Kitchen will be offering these festive offerings daily from 12.00 noon to 8.00 pm and the Wisma Genting OneHub will be from Monday to Friday from 11.00 am to 4.00 pm. Good news to folks who like to eat moon cake. Resorts World Genting is offering a 30 percent discount for purchases of 50 boxes or above of any four-piece variant set. Do take note that the discount is not applicable to God of Wealth cookies and Kam Tui mooncakes. All mooncakes sold are produced in Hotel’s mooncake production kitchen, where a team of specialised mooncake makers work tireless to come up with timeless and creative new culinary offerings with which to celebrate one of the most joyous seasons in the Chinese calendar of festivals. For more information, you can call 03-27181118 or log on to www.rwgenting.com.